For many years metal chairs were the norm for visiting groups at Camp Wawona. But as time kept up it's steady march, the chairs, though made of a seemingly indestructible materials, grew weary from constant service. Staff were constantly fixing them and storage on metal carts (mankind's worst invention next to the Atomic Bomb) became increasingly impractical. Indeed, it was time for new chairs. 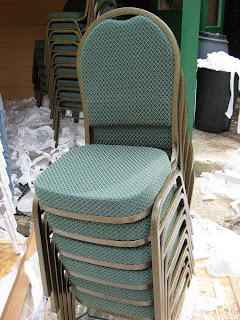 After a disappointing first round with a local chair company, chairs were finally ordered elsewhere and the shipment arrived on Tuesday, March 16. 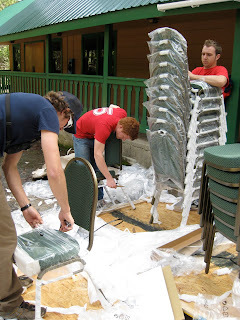 It took five staff more than three hours to unwrap and stack the 160 new chairs. However, once completed, staff were pleased to see the new chairs could easily fit into the storage space alloted, making setup and take down much more practical. After months of waiting, the chairs are unpacked and ready for service. The old chairs will be sorted with the sturdiest remaining at camp for overflow use while the remainder will be permanently retired. Staff unwrap the new chairs one by one. 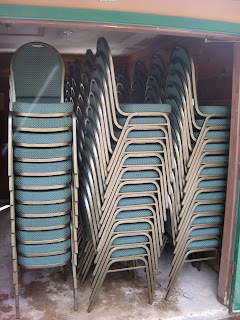 A stack of new chairs waits to go inside. 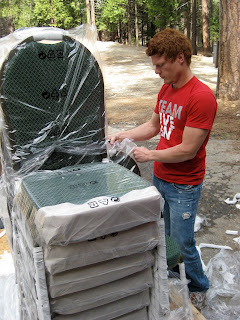 Derek unwraps a chair while several more wait their turn. Chairs stacked inside add on side room at the lodge. 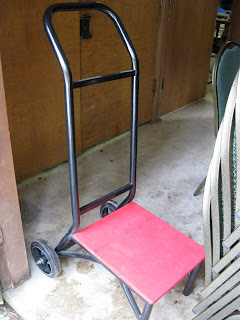 Cart used to move stacks of chairs. 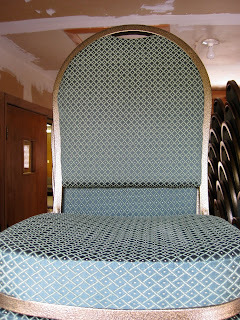 Close up of a new chair.